Fellow aviation geeks, don't be too tempted to quibble over just how authentic the new television show, Pan Am is - already Mickey Maynard is tweeting that the blue of the stewardesses uniforms is the wrong shade. And I confess, when I saw the first episode, (I got to see it two weeks ago but you'll have to wait until Sunday - Thanks Sony!) 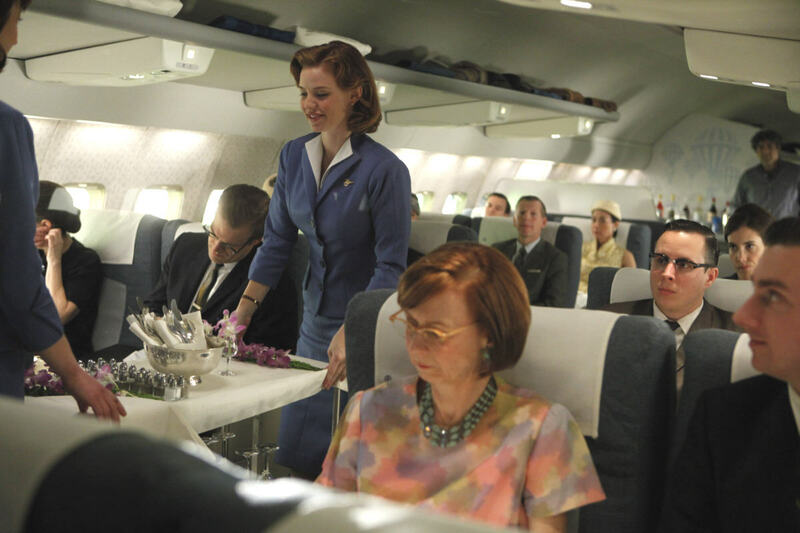 I did wonder if the set designers couldn't do a better job on the B707 boarding bridge. Still, if handsome Capt. 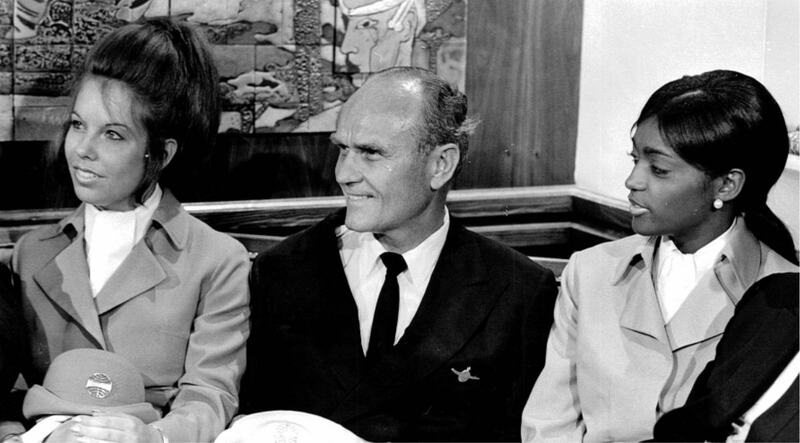 Dean Lowrey looks too young to be in command of a plane full of 1960s-era travelers, think again. Think in fact, of Capt. Robert Evans. Through a family connection, I was privileged to spend a few days this summer reading the memoirs of Capt. Evans, who flew for Pan Am from 1940 to 1976 - a career that started when he was just twenty-four and took him from the Sikorsky S-42 to the left seat of the Boeing 747, then and now the queen of the sky. It's no wonder Evans took time from traveling the world to jot down his stories. In a chapter of his book called Unusual Earthly Sights, he describes the sun rising in the west over Scandinavia, a view of Victoria Falls while diverting to avoid weather, experiencing the Aurora Borealis north of Labrador and encountering static electricity known as St. Elmo's fire, that made his airplane glow. "The bright fiery glow enveloped props, wings and fuselage. A blue ball of static developed in the cabin - rolling down the aisle - and discharging off the tail. 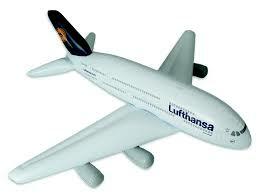 Flight service reported a lot of wide-eyed passengers." I'll bet! 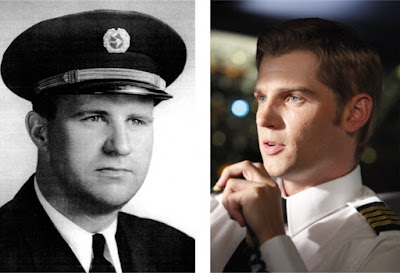 So today, as I sat at the Brooklyn film studio where episodes of Pan Am are being shot, talking to the actor Mike Vogel who plays the Pan Am Sky God Dean Lowrey on the weekly program, I reminded myself that Capt. Evans probably looked a lot like him. Vogel described a childhood growing up by Pennsylvania's Willow Grove Naval Air Station, spending so much time watching the airplanes take off and land that he learned to distinguish a P-3 from an A-4 by the sound of their engines. Aviation was a first love that never died, he told me, which explains why Vogel flies a 707 on TV while working on his PPL in real life. While the perfectly coiffed Vogel and his co stars did their thing under the studio lights, off to the side Sherry Zahner, was fussing over the shrimp appetizers that the four women who play Pan Am stewardesses will use in the next scene. Sherry was a Pan Am flight attendant in that era and she's gonna make sure the service details are true-to-life. 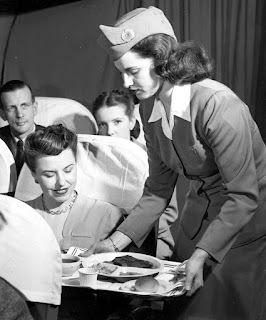 In the sixties, heck, through the eighties, stewardesses on Pan Am didn't just serve pretty food, they cooked it too. Sherry says her years at the airline were the best time of her life. Sure the work was hard. If it was easy everybody would be doing it. 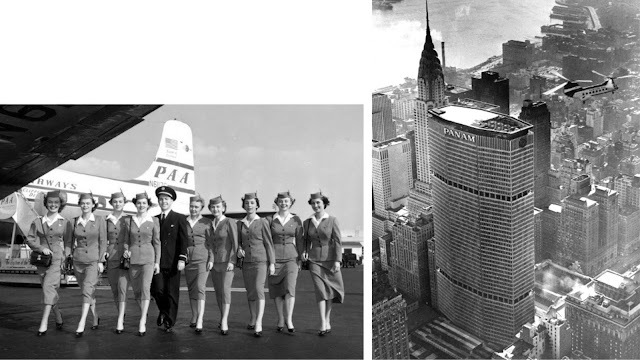 But Pan Am didn't hire just anybody. The airline wanted educated, multilingual flight attendants. The recruiters went to college campuses, which is how Candice Adams Kimmel, French-speaking with a degree in history ended up becoming a stewardess. 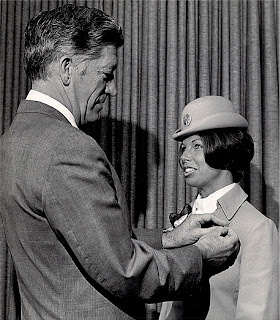 With two months experience she was flying to Rome, hanging out with other stewardesses who were "doing everything but saying 'sombody pinch me'" she recalled when I spoke with her earlier this month. They all thought they were dreaming. It just didn't get any better than this. But it wasn't all carefree excitement for Candice. In 1971 she was on a flight that was hijacked to Cuba. That's her with co-workers talking about the four-day event on CBS News. Scary? I think so. Especially in the post September 11th world. But consider this, between 1968 and 1972 there were more than seventy - that's 70 - airplane hijackings. So if there's an episode of Pam Am the TV show which includes that in the plot, don't be surprised, that's all I'm sayin'. Handsome men starting out with responsibility beyond their years, strong women circling the globe with all the attendant joy and danger. Dazzling airplanes flying faster and farther. Who doesn't want to watch all this on television? There's so much material and just plain old gratuitous shots of beautiful people, places and planes. So don't quibble about the small stuff. We've got an opportunity to take a trip to a time when aviation was big. Very big - and on top of the world. Brilliant blog, as usual. Thanks so much. I love this, and looking forward to the show. Last month one of my Flight Attendants told me she use to be a Pan Am Flight Attendant, and still had her uniform in her closet. We chatted about our grandkids, hers teenagers, and then I said, "Wait. They're going to watch that show and know what Grandma was up to." She got a huge grin on her face, her eyes flashed to another place and time, and she said, "yeah." Remember..."These" are the good old days. Christine, It was neat to read about Mike Vogel's affinity for aircraft and the Willow Grove Naval Air Station. I grew up about 2 miles off the approach end of runway 33 at Willow Grove. My friend in the next office was Squadron Commander for one of the P-3 squadrons based there. The airport closed a few months ago, which is a shame. I did get to put the identifier, NXX in my logbook though, as we always worked the “Sounds of Freedom” airshow there. The trick wasn’t telling the difference between the A-4’s and P-3’s, it was between the P-3’s and C-130’s. Same engines, but the 130’s just seemed a bit deeper. There was a lot of history at that airfield. I watched an A-4 crash right in front of me in 1990. Cool to think that a fellow NXX airplane geek got to be an actor! Keep up the good stuff! Along with the glossy opening episode of ABC’s Pan Am TV series Sunday was a somewhat related article in the Seattle Times soliciting money. This warmed my heart. 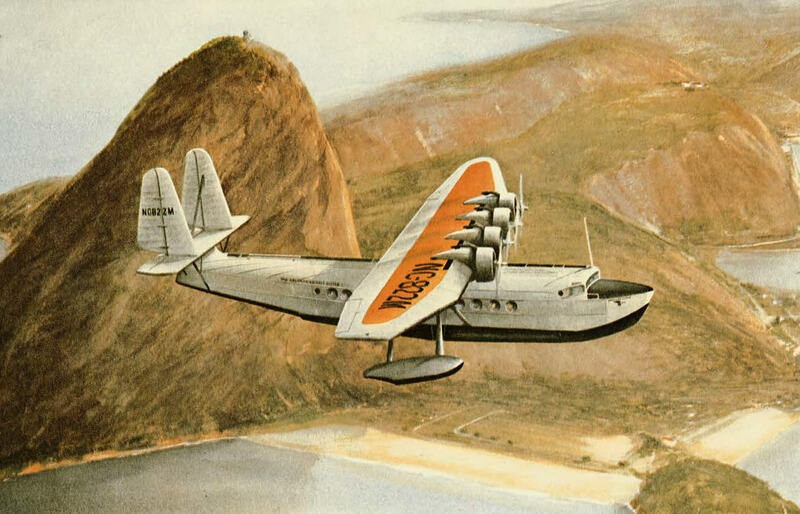 It’s hard to imagine an airplane that evokes more romance and nostalgia than the 314 Clipper, especially the Clipper that flew from between San Francisco Bay and in Honolulu. 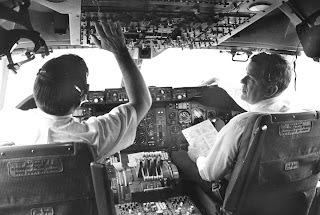 One reason the “boats” stir my emotions is because my late dad began his Pan Am career as a junior flight engineer on the 314’s. He logged over 2400 hours in these airplanes, including on the Honolulu Clipper. Recovering this iconic airplane would be recovering a remarkable piece of aviation history, and I guess a piece of my personal history. Heck yea, I contribute some money to this non-profit!